If you could live in any country in the world, which would you choose, and why? To be perfectly honest I love living in the UK so wouldn't change it! Of course some things could be improved (no, not the weather, I'm not one to spend time in the sun. In fact, it frequently gets far too hot for me here on the NE coast, the last thing I would want to do is live somewhere warmer! I was mainly thinking of fabric and petrol prices!) 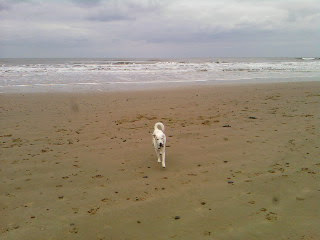 but I have my family and many of my friends here on Teesside and I love living at the seaside! My mam used to sew when I was little and I used to long to stay when we dropped her off at dressmaking/tailoring classes. (She made my First Holy Communion dress and I was the only one with a hand made dress. I was really proud as I thought, and still think(! ), it was the nicest dress there - knee length Broderie Anglaise finished off with white ankle socks and sandals, perfect for a six year old!) I used to enjoy making things out of scraps of fabric and playing in the button tin and I was fascinated by the sewing machine. Mam taught me to knit (and how to crochet granny squares) and then we both got bitten by the cross stitch bug when I was about 10. I've also made some of my own clothes and costumes for school productions but didn't enjoy it anywhere near as I enjoy quilting! My only experience of patchwork was when my mam made EPP hexagon flower pincushions for a school fayre when I was about 7. She spent hours making them and they were priced at about 5p each - she didn't make any more!! It wasn't the best introduction but I've always loved hand sewing and when I first got poorly (for those of you who are new to my blog/don't know I have CFS/ME) I decided to give it another go...the rest, as they say, is history! Which gizmo has made your life truly easier? There are a few that have made me cry - My Best Friend's Girl by Dorothy Koomson, The Time Traveller's Wife by Audrey Niffenegger, The Friday Night Knitting Club by Kate Jacobs and Message In A Bottle by Nicholas Sparks. There are bound to be more but these are the books that spring to mind. What is your favourite cartoon from childhood? 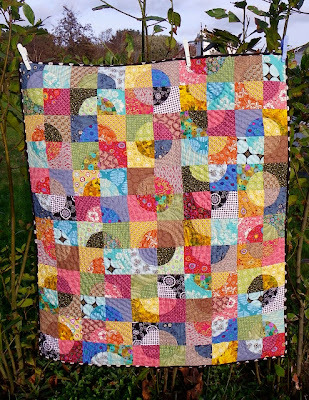 What is your favourite quilt made by someone else? Oh, that's a tricky one! I love so many of them and my choice changes by the day but the one that's stuck in my mind for quite a while is this one by Alison@Little Island Quilting. I love everything about it! I need a day on the beach. Where would you recommend? I love the beach nearest me - if the breeze is off the sea you wouldn't want to sunbathe on it but if it's off the land then it can be lovely in the summer and it's perfect for building sandcastles, paddling and, if you're brave, swimming! 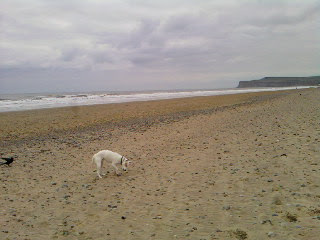 I've visited some lovely beaches as a child (my hay fever meant we always had a seaside holiday!) but I don't think you can beat Scarborough (in North Yorkshire) for an old-fashioned family day at the seaside! If a sewing retreat could be held in a place of your choice and all your friends would be able to attend where would you have it? Last year I taught at a retreat held in a local hotel and that was lovely (and local so I could travel in every day rather than staying!) 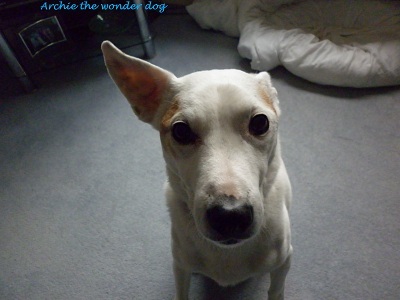 but if I was staying then I'd want to bring Archie (how could we all get together and miss out Archie?!!) 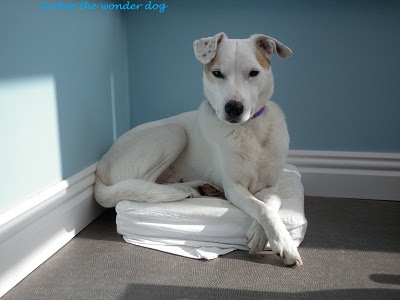 so if anyone knows of a dog and quilter friendly hotel where we could all have our imaginary get together then speak up! (Preferably somewhere not too hot and with lovely places for Archie to walk in and near some fabulous quilt shops!) Actually, given that this is an imaginary get together I could just conjure one up!! 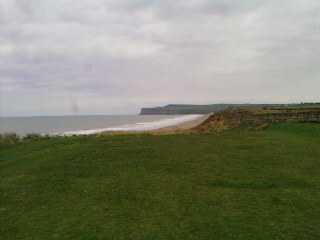 So, it would be on a cliff top with access (via a winding path!) to a lovely quiet beach. The food would be fabulous, there would be plenty of tea (and coffee!) and biscuits, lots of wonderful bedrooms for all my friends and a series of comfortable rooms where we could stitch and natter and a row of beach huts on the beach for those of us who like to stitch in the great outdoors! Oh, even better, how about we just move the Cluedo mansion to the seaside?!! Without the murder, obviously!! What is the first sign of spring for you? Which sewing task do you dread the most? Trimming the excess wadding and backing ready for the binding to be stitched on - it could all go horribly wrong!! I'm not going to pass on the tig but if anyone would like to be tigged by me then please consider yourself it and answer these questions. If you let me know you're it then I'll add in a link to your blog! Do you still have any of your toys from childhood? If so please tell us about one of them (a photo would be great!) and if not then which one do you wish you still had? (Copied from Susan!) Which sewing task do you dread the most? What make and colour thread is currently threaded through your needle? Do you wear a watch every day? If yes, would you be lost without it? I'm looking for a film/DVD box set to watch whilst I stitch some hexies, what would you recommend? Which book(s) are you currently reading? (If you're not reading anything at the moment what would you like to read/flip through next? especially when you've got legs as long as mine! And he doesn't often lie like this but I love it when Archie shows off the fact that he's got four legs - I call it his 'collecting paws' pose! Do you mind, I'm trying to sleep! Right, I'm off, time to get in my 'jamas and make a pot of tea so I'm ready for NCIS! 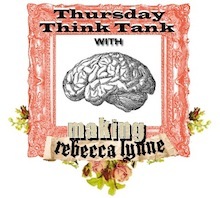 I'm finally linking up to Think Tank Thursday with Rebecca Lynne! Oops, just realised it's actually Thursday Think Tank - I've been reading that wrong for months!! And I'm not sure there is a TTT to link up to this week but it's taken me so long to have a post to link up that I'm leaving the button where it is! This week I've been thinking about a few things which, to be honest, is hard when you're as tired as I am at the moment. I currently have the concentration span of a gnat and can't seem to keep hold of a thought long enough to actually think about it. I tend to just notice it as it passes through my brain and say to myself 'That looks interesting, I hope it's still there when I come back.' and sometimes it is and sometimes it isn't. After writing some of this post it appears I've thought more than I realised this week (well, over several weeks, if I'm being truthful!) 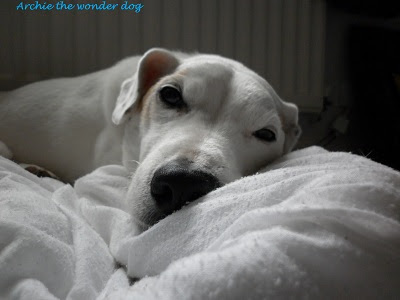 so you may as well make yourself a cup of tea and grab a biscuit, you may be here some time! Feel free to skip the writing and jump straight to the photos! One of the things I've been thinking about is Pinterest. When I first joined I wondered what the company was getting from it - how did they make money given that there are no adverts, what's in it for the company directors, etc. And then I read this blog post by Heather@Little Tin Bird and followed her link to this blog post about Pinterest and suddenly I became rather worried. I'll wait while you go and read the links - don't forget to come back! I've stopped pinning until I work out what to do - is it just the stereotypical 'I'll sue' mentality that seems to be growing evermore ridiculous (like 'caution this coffee is hot' labels - it'd better bleeding well be hot, that's what I asked for!) and yet frighteningly pervasive or is it more serious than that? I've since read the update post and also the date with Ben Silbermann post and whilst it seems that Pinterest may be working on possible solutions I won't be using it until I'm sure where I stand. I'm contemplating deleting my boards but I'm going to wait for a bit and see what happens (and I want to go through my pins and bookmark my favourite tutorials, etc. so I don't lose them) - please let me know what you think. I love pinning and really don't want to have to stop. I suspect I'm being a little ridiculous about it and would love to think 'sod it, I'm going to carry on' but I'm not brave enough...not today anyway! I've also been busy cutting blue and white squares for the nine patch/snowball quilt which also involved more thinking than I anticipated (when doesn't it?!) and a slight change in plans but I'll save that for another post as there's already far too much in this one! 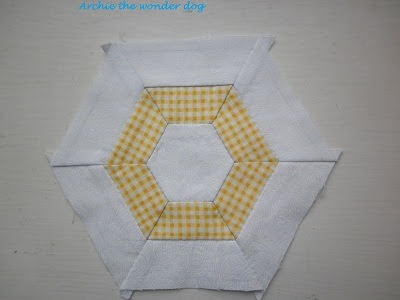 The final thing I've been thinking about this week is my hexy quilt. 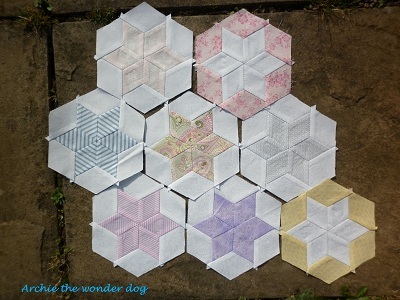 Over the past few weeks I've prepped the pieces for another 23 hexies and they're in a queue, waiting to be stitched. I was getting slightly concerned that I wouldn't have enough white on white background fabric to make the 202 hexies I was planning but I'd forgotten (until Nicky reminded me!) 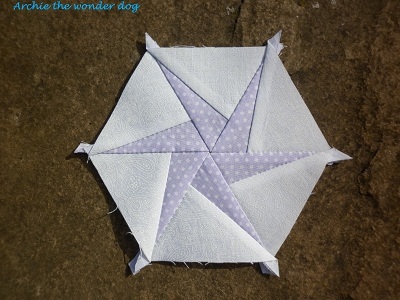 that I'm also going to add in some whole (unpieced) hexies like this one so it may work out all right in the end. I'm going to keep going until I run out of background and then see where I'm at. Unfortunately one of the hexies I've made isn't as attractive as the rest and although it wasn't evident when I set out the pieces or even when I was stitching them together it soon became apparent when I finished that I'd made an ugly hexy. I put in the last stitch, knotted and cut the thread, finger pressed the seams, turned it over and exclaimed 'Bloody hell!' and then laughed. Want to see an ugly duckling hexy that will probably never turn into a swan?! Promise not to laugh?! I don't believe you! How did I not realise what I was making?!! I've been hoping that it wouldn't look as bad when it was with the other hexies but I think I'll always look at it and think 'There's the radioactive hexy' (as I've come to call it!) which could be rather annoying after a while so I'll have to change it. And after all the effort of getting the gingham squares to match up too! If this was your hexy what would you do?! Live with it? Replace the three big triangles with three of the grey/white/yellow pieced triangles? Give it up as a bad job and chuck it out? 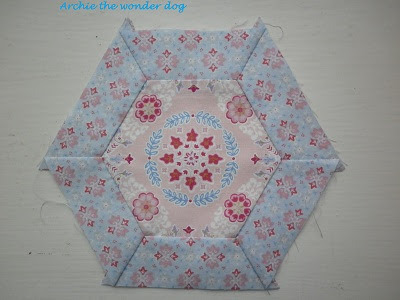 Unpick it, salvage the fabric and hope to use the bits in future hexies? All suggestions welcome! 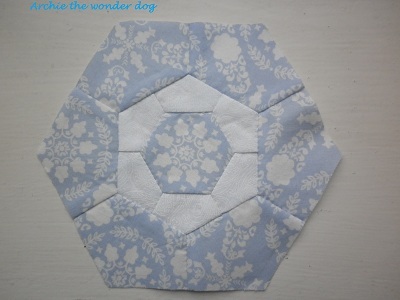 Fortunately I've also made some prettier hexies in the past few weeks so these might take your mind off the ugly one! 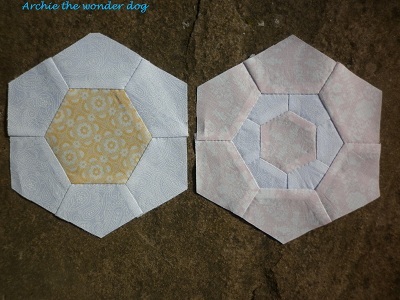 I love these hexagon in a hexagon (in a hexagon) designs. and I'll be making lots more! I was planning to make a whole bed quilt of hexagon stars but when Lynne started the hex-a-long I was thrilled by all the possible variations on a hexagon so I abandoned my plans and decided make lots of different hexies instead. I'm glad I did but this photo makes me wonder what the abandoned quilt would have been like. Mind you, the thought of hand piecing 202 identical blocks and with only the changing fabric to keep me entertained is a little overwhelming! Maybe one day I'll start one as a long term scrappy project - it'd be really good for using up all my scraps of white and would be nice to do in between other projects! Looks like I've just talked myself into making 202 identical blocks!! I think that's all my thinking...I thought there was something else but you know what thought did, don't you? I'd also like to say thank you to Tanya@Second Chance and Tina@Holy Scrap! for nominating me for the Liebster award. I'm honoured and thrilled to be nominated again (I've received this from several people in the past few months - thank you to you all, I really appreciate it!). I'm afraid I'm still going to break the rules and not pass it on but this time I'm going to explain why. I love the way it supports and encourages small/new bloggers (it's always lovely to know that people enjoy reading your blog and I can't imagine that changes, even if you have thousands of readers) and it's always lovely to get a recommendation for a great 'new to me' blog from someone you know. It's amazing how a really great blog can completely pass you by and then one day you find it and spend ages reading through the archives and leaving comments on posts that are six months old...Just me then?!! A Random Fact I'm really scared of the dentist. I hate the noise. I hate the smell. I hate the feeling of those cotton wool sticks in my mouth. I hate sitting in the waiting room and knowing that soon I'm going to have to face my fears. In fact the only thing I don't hate is leaving! Every time I go for a check up (and I avoided them for years until the 'my teeth are falling out' dreams got so bad I had to acknowledge I was avoiding the issue and actually go!) Once I'm in the chair I concentrate on my breathing and slowly count backwards from 300 - one count for every breath in/out. I'm not entirely sure it works but at least it gives me something to think about other than 'Is she nearly finished yet?' 'Has she found something that needs treating' 'Will I get away without a scale and polish?' (Yup, I even find those hard to tolerate!) And I cheer when I'm allowed to get up and then feel really proud of myself as I walk back to the car. I would quite like a sticker to acknowledge my bravery but they don't tend to give them out once you get past 10! Another Random Fact I had quite a few teeth removed as a child and once slapped (or tried to slap, now I think of it I'm not sure which it is!) 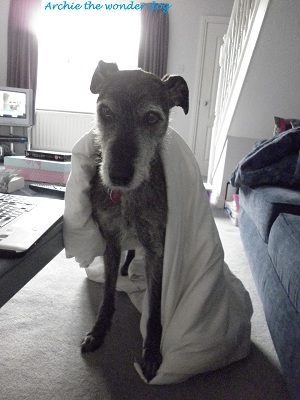 the dental nurse as I came round. You can imagine how well that went down! (And I was far from a stroppy child - I wouldn't say boo to a goose!) And after an operation on my knees I bit through the intubation tube (and my bottom lip - ow! That hurt more than my knees!) and tried to jump off the trolley as they wheeled me back to my room. Both legs were heavily bandaged from mid calf to mid thigh and wouldn't bend so goodness knows where I thought I was going! Let's just say I don't react well to anaesthetics!! 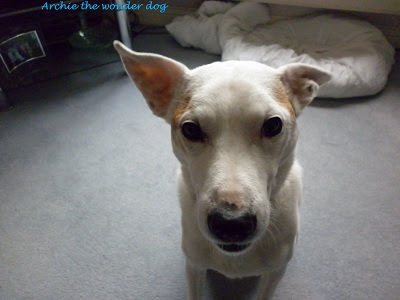 Archie's head suddenly appearing under your hand (often when it's holding a camera!) and then tipping backwards until the heel of your hand and fingers are resting upon his ears, at which point a plaintive whine will be issued. 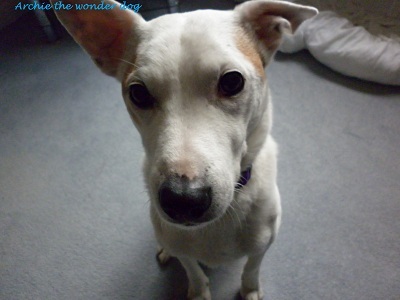 If that fails the 'how can you ignore me, I'm so cute but hard done by' gaze will be deployed which rarely fails! Thanks for popping in - please don't forget to tell me what you think about Pinterest and the ugly hexy! P.S. If you're quick (and a UK resident) you just have time to enter Susan's giveaway - it closes at 12noon today (Friday 16th March) so rush on over and enter! Sorry for the short notice! P.P.S. I can't remember if I've already blogged about this but did you know that Judith, formerly of Rags to Bags and now recently moved to Just Jude has opened an Etsy shop Just Jude Designs selling cushions, bags and patterns? If you're looking for a present or a pattern it's well worth a visit and the patterns are easy to follow and very well written - go on, treat yourself! ...or you might end up feeling a bit odd. At least I did after failing to realise that the cooking instructions for my tea on Friday night (a fish cake) were for when you were cooking from fresh and that a frozen fish cake requires an extra ten minutes in the oven! Oops! I spent yesterday in my jamas huddled under four quilts watching repeats of NCIS. I feel considerably better today but if my post is lacking a bit of oomph and sparkle then please forgive me!! And don't worry, I haven't got food poisoning, just a slightly sore tummy and no appetite! I'll be reading instructions twice from now on!! Anyway, let's move onto more pleasant things - how about a biscornu? 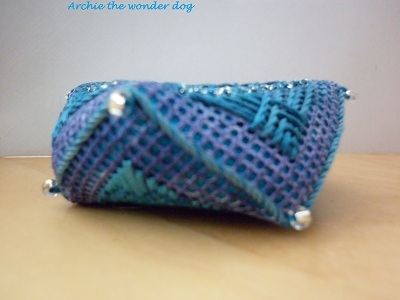 (An eight-sided cushion, often used as a pincushion or scissor fob.) There's a lovely selection of them on this site. I'd not made one of these before so when my friend, the very talented and lovely Beryl at Knot, advertised a one day biscornu workshop at her studio I couldn't resist. (She doesn't have a website but if you're in the Teesside area and want to find out more please email me!) 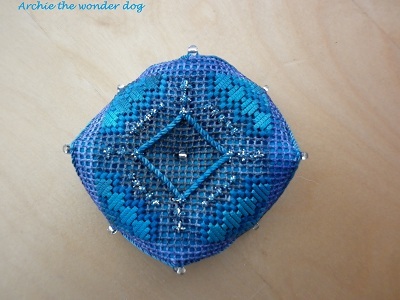 Mind you, who can resist an entire day of stitching with like-minded people?! Not me, that's for sure! We had a wonderful time choosing which Oliver Twist one-off bundle of threads (a variety of ten hand dyed cotton and rayon threads) we wanted to use and dyeing our canvas to match/contrast. (Just to let you know that I've not used the website I've linked to but it had the best range of the bundles I could find.) A good time was had by all as we learnt new stitches and chatted. By the end of the day I'd done a fair bit of stitching but not as much as others who'd done counted thread work before. I've only ever done counted cross stitch but although the counting is different (you count threads rather than holes) it stood me in good stead, I think! 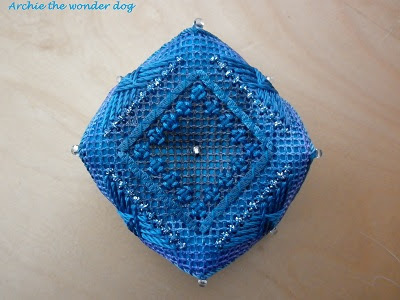 It only took another few hours to completely finish my pincushion but it's taken me considerably longer to blog about it! Side one - stitches include Sprat's Head (unfortunately named!) and couching. A poor photo of it from the side - this was the best of a bad lot!! It's far too nice to ever stick pins in but looks lovely in my sewing room! There's a good site here with step-by-step instructions on how to make a biscornu once you've completed the embroidery and I think suitable patterns would be quite easy to find. I quite fancy a plain oversized one in velvet as a comfy cushion for my settee! I've got some blue velvet in the loft and one of these days I'm going to drag it out and cut into it rather than just admiring it! I'm also a little behind on sharing my hexies. I haven't stitched any in a couple of weeks as the DPs have taken over my hand stitching time but I've got about 10 that I've stitched and not shared. I'm only going to show you a few today as the weather is so awful this afternoon that it's hard to get a decent photo. I managed to get this photo of Archie before the sun completely gave up - compared to now it looks like glorious sunshine! 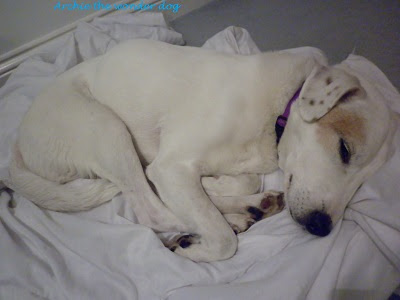 Can't a dog get forty winks round here without being disturbed? Hexy 61 - I love this blue and white print! Hexy 62 - looks better in real life! 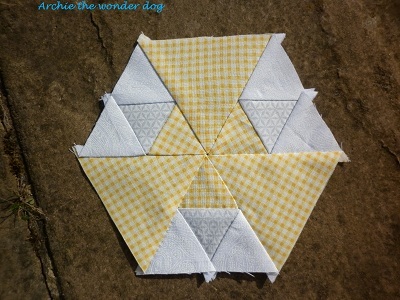 Hexy 63 - love these windmill hexies! 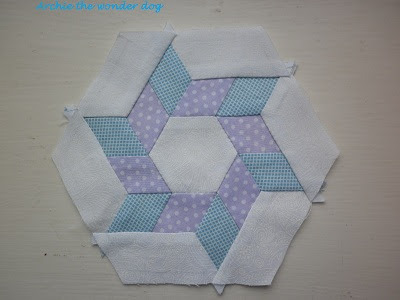 Hexy 64 - nice and simple to offset some of the fancy pants hexies in the quilt! A few weeks ago Archie and I went for a walk on our local beach - I had to go to the library and the cobbler so decided to take Archie with me and treat him to a walk through the valley gardens and onto the beach. 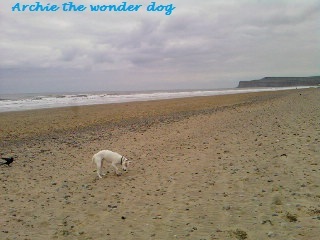 He loves all the smells and I love the sight and sound of the sea! I'm afraid I forgot my camera (bad blogger...again!) but I took some photos on my mobile - they're not great (again!) but I think you'll like them! 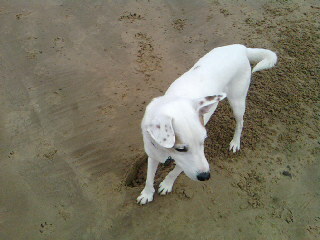 I love the seaside - did you mention biscuits?! I did - I thought that if I could get him to come closer I'd stand a chance of getting a half decent photo so I threw half a dozen or so tiny biscuits for him to find...I'd not counted on the local wildlife being brighter than Archie though! And he was. 'He' being a rook who'd obviously memorised where the biscuits had fallen and had eaten five by the time Archie had sniffed out one - you couldn't see them as they were the same colour as the sand and Archie was having a hard time finding them. Not the rook though -you've got to admire a skill like that! I didn't think birds would eat Chappie but maybe it makes a nice change from worms and insects! Sustenance, I need sustenance - I'm in danger of fading away! I'd love to live in one of those houses, imagine the view! 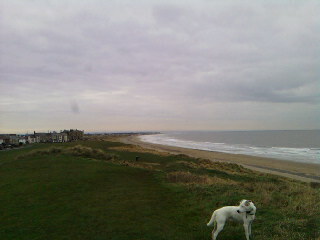 I think I'm very lucky to live near such a lovely beach. 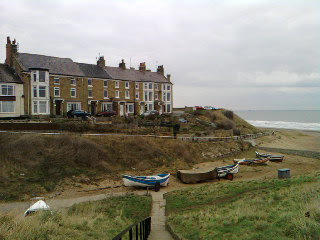 This is where Mam, my brother and I spent many days in the summer holidays (when it was fine enough) as we lived just ten minutes walk from the dunes - sand and egg sandwiches, paddling and sand castles, what bliss! 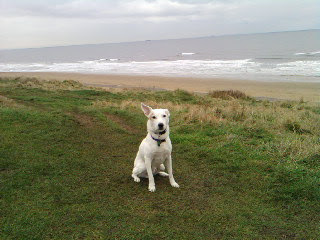 Even in the 'breeze' from the North Sea that often turned us blue!!! And thank you to Sheila and Leanne - I'm honoured and it's very nice of you to say such nice things! I'm afraid I'm going to ignore the rules (again!) and share some random facts over the next few posts...I hope that's ok?! Pssssst! *looks around and then beckons* Over here! Now, don't tell the Quilt Police (and if you happen to be one then look away now) but I break the cardinal rule of rotary cutters...I cut towards myself! I promise I'm careful though! Now remember, not a word to the Quilt Police, ok?! Another Random Fact Archie has a funny foot. As far as I know it doesn't tell jokes, recite limericks or do impressions but there's always a first time..this was the best photo I could find of it - Archie's out on a walk at the moment or I'd take a better one! The vet thinks someone stood on it or trapped it in a door when he was a puppy. 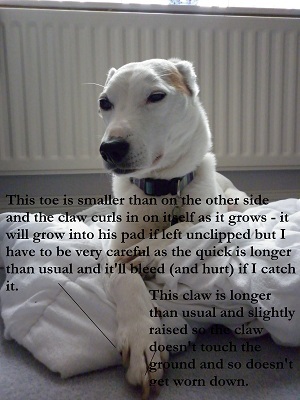 It doesn't affect him in the slightest but it does make those two claws very hard to clip. I usually do it myself with my nail clippers and an emery board as it's safer than the dog claw clippers I've got. I've never caught his quick when trimming his claws but the vet did once (it's very easy to do as the quick is almost at the end of the claw) and it needed cauterising...poor Archie!! That's it for today - I hope you've enjoyed all the photos?!! Even the bad ones?! I'm off to catch up on blog reading/emails...I think a cup of tea is in order and maybe a sneaky 'you'll spoil your tea' biscuit! Maybe my appetite is returning! P.S. Do any of you have a free Flickr account with more than 200 photos uploaded? Does it annoy you that you have photos that are unavailable? I'm almost up to my limit and I'm starting to wonder if I should delete some of my older photos to make room or ask for an upgrade for my birthday. Is the upgrade worth the money or are there, as I suspect, better things to spend £15 a year on?! I know a lot of you will have an opinion - please let me know what you think! P.P.S. I'm sure there was something else I meant to mention - I've got no idea what it was but I've forgotten to acknowledge something/someone please give me a not-so-gentle nudge! Thanks!